Athletes, the elderly and others who suffer from injuries and arthritis can lose cartilage and experience a lot of pain. Researchers are now reporting, however, that they have found a way to produce cartilage tissue by 3-D bioprinting an ink containing human cells, and they have successfully tested it in an in vivo mouse model. The development could one day lead to precisely printed implants to heal damaged noses, ears and knees. The researchers presented their work today at the 251st National Meeting & Exposition of the American Chemical Society (ACS). "Three-dimensional bioprinting is a disruptive technology and is expected to revolutionize tissue engineering and regenerative medicine," says Paul Gatenholm, Ph.D. "Our team's interest is in working with plastic surgeons to create cartilage to repair damage from injuries or cancer. We work with the ear and the nose, which are parts of the body that surgeons today have a hard time repairing. But hopefully, they'll one day be able to fix them with a 3-D printer and a bioink made out of a patient's own cells." Gatenholm's team at the Wallenberg Wood Science Center in Sweden is tackling this challenge step by step. First, they had to develop an ink with living human cells that would keep its shape after printing. Previously, printed materials would collapse into an amorphous pile. To create a new bioink, Gatenholm's team mixed polysaccharides from brown algae and tiny cellulose fibrils from wood or made by bacteria, as well as human chondrocytes, which are cells that build up cartilage. Using this mixture, the researchers were able to print living cells in a specific architecture, such as an ear shape, that maintained its form even after printing. The printed cells also produced cartilage in a laboratory dish. "But under in vitro conditions, we have to change the nutrient-filled liquid that the material sits in every other day and add growth factors," Gatenholm says. "It's a very artificial environment." So the next step was to move the research from a lab dish to a living system. Gatenholm's team printed tissue samples and implanted them in mice. The cells survived and produced cartilage. Then, to boost the number of cells, which is another hurdle in tissue engineering, the researchers mixed the chondrocytes with human mesenchymal stem cells from bone marrow. Previous research has indicated that stem cells spur primary cells to proliferate more than they would alone. Preliminary data from in vivo testing over 60 days show the combination does indeed encourage chondrocyte and cartilage production. Gatenholm says further preclinical work needs to be done before moving on to human trials. To ensure the most direct route, he is working with a plastic surgeon to anticipate and address practical and regulatory issues. In addition to cartilage printing, Gatenholm's team is working with a cosmetic company to develop 3-D bioprinted human skin. Cosmetic companies are now prohibited in Europe from testing cosmetics on animals, so they hope to use printed skin to try out makeup, anti-wrinkling techniques and strategies to prevent sun damage. More information: 3D Bioprinting of Living Tissues and Organs with Polysaccharide Based Bioinks and Human Cells, the 251st National Meeting & Exposition of the American Chemical Society (ACS), 2016. Having worked on the knee I'd like to add a caveat here (note the authors ofthe original article do NOT talk about knee cartilage). 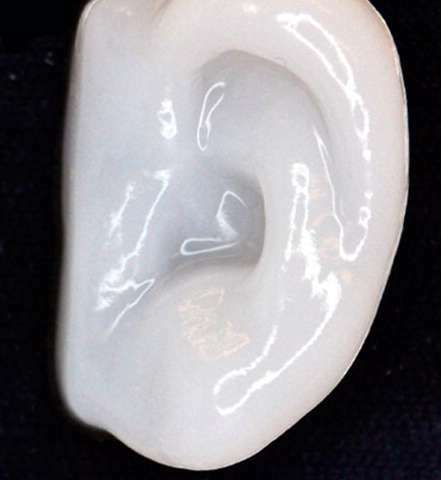 Nose and ear use (largely) unstructured cartilage and are not subject to (much) stress, so 3D bioprinting works very well. Cartilage in the knee is a different critter. You have a very defined orientation of the cartilage cells (parallel close to the bone which slowly goes to upright in the middle layer and then parallel again at the articulate interface. Just dropping in a bit of cartilage in the right shape is not enough. This was tried with ex vivo cultivation of cartilage tailored to the defect shape. But once it was implanted the different biomechanical properties of the structured and unstructed regions quickly led to degradation at the interfaces due to high differential strains. I think it might not be far off when we can print structured cartilage to address this. But there's still some work to be done. I wonder if the implant would activate the immune system and cause some sort of rejection.